Conveyor Brushes Brooms are bristled, long-handled cleaning brushes used for the collection and disposal of dust and debris in places of business, homes and in public spaces. Brooms are the most limited of all brush varieties in terms of their use on an industrial scale. 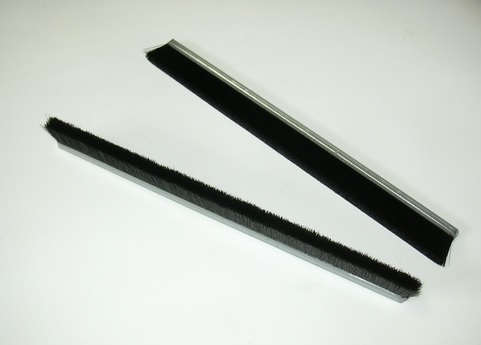 Conveyor brushes are a secondary cleaner that can normally be used on any type of conveyor belt, though they are particularly well-suited to nonskid and cleated applications. Tools that can either be stationary or rotary, conveyor brushes can be positioned so that they contact the belt very lightly. This prevents them from wearing against belts or other raised belt components. Conveyor brushes take many forms, in order to clean a variety of materials, like powders and dusts. Such forms include spiral coils, spiral wound on core, and strips and scrapers. Each of these conveyor brushes has a different strength. Spiral coil brushes are lightweight and somewhat universal, used with a wide range of RPMs, sizes, materials and densities. Thus, this brush, which is often available with an installation kit and mounting shaft, meets the needs of a large group of applications. 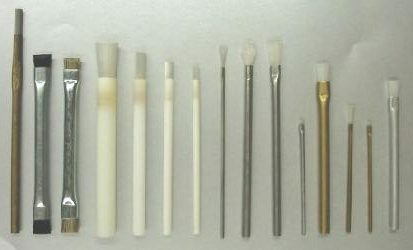 When deciding on the use of conveyor brushes for a project, several factors must be taken into consideration. The first factor is mounting location. A conveyor cleaning brush should be installed on the outlet end of the conveyor, after and below the head roller or rollers. 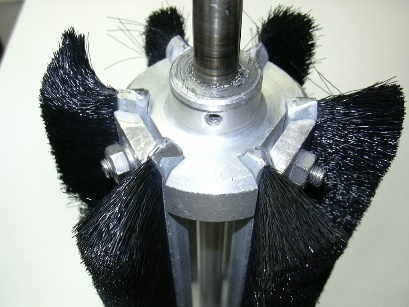 Additionally, the brush should be mounted in proximity to a support roller for consistent brush surface pressure. The second factor to consider is design width and diameter. A conveyor brush should have enough room that, when installed, it is wide enough to overlap each side of the belt surface by half an inch. This ensures complete coverage and accommodation of normal belt weave. The next thing to consider is size and selection of fill material. After that, a potential customer must consider brush density. Then, he or she must consider refillable versus replaceable and integral versus removable shaft. Finally, a customer must consider operating size and speed.